We arrived in Aqaba full of expectations and hope. Despite the mysteriously missing “u” it seemed like a clean, organized city, with surprising views of both Egypt and Israel. Coming off our rocky relationship with Egypt and all its highs and lows we were anxious to believe the hype about Jordan. Were we ready for this though? Or was Jordan to be merely a rebound country to be discarded and forgotten? Only time would tell. 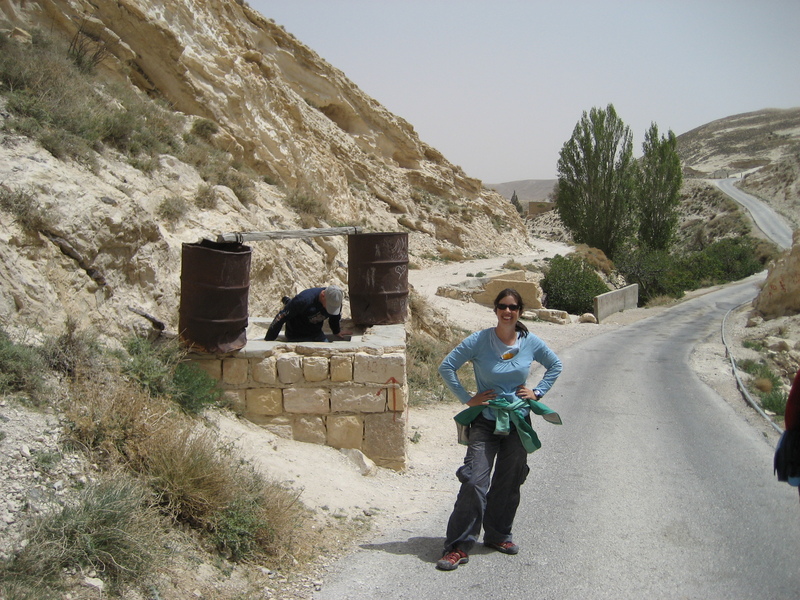 We quickly move on to Petra with the reckless haste of those intent on starting a new chapter. And Jordan, that bubbly wench, was right there offering all we craved, our wildest desires there for the taking (except milk). Intoxicated with the excitement and newness of it all we were easily led. But would it be too much, too soon? 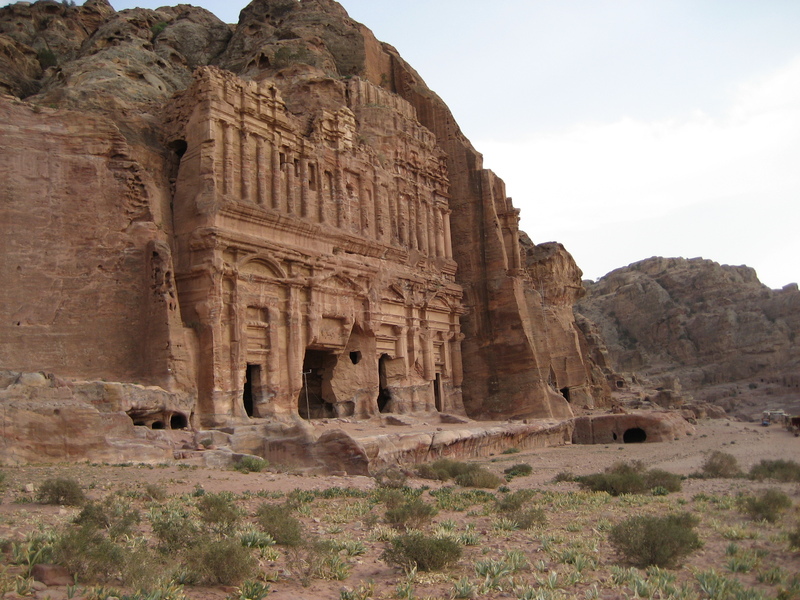 The ancient rose-red city of Petra. 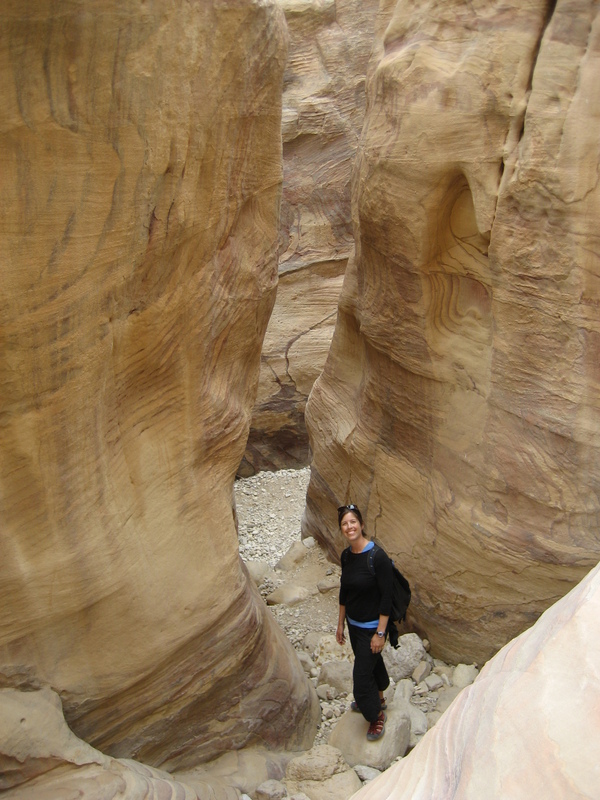 Built in a hidden valley by the Nabataeans, preserved by location and climate, made famous by Indiana Jones and recently voted one of the new Seven Wonders of the World. The question was, would it disappoint under the weight of heavy expectations, leaving us to wallow in shame and self-loathing? Not a chance. 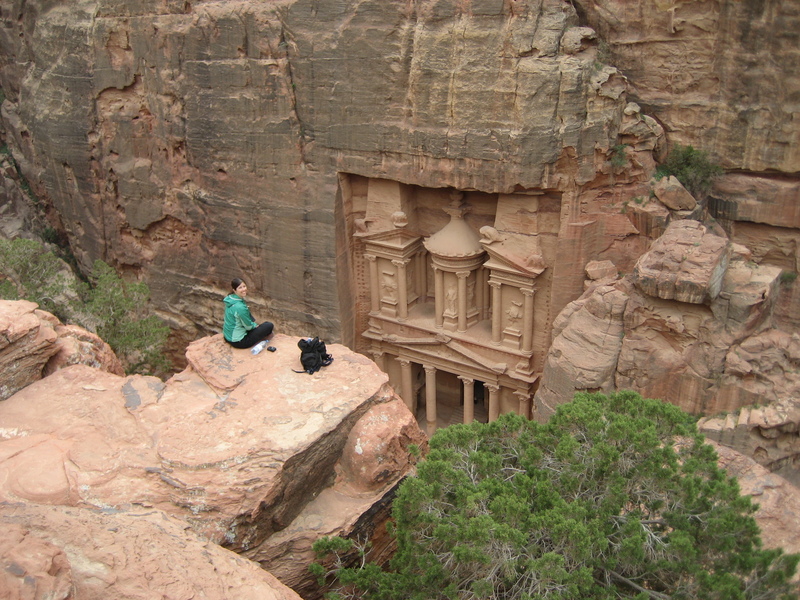 Petra turned out to be a stay-up-til-dawn, call-in-sick-to-work, apply-soothing-lotions-as-needed kind of place. Three days of hikes, views and tombs before we emerged, sated and weak, our previous worries and complaints vanished in a fog of lusty sightseeing and steep stone steps. Such as the large crowds streaming down the rough cobblestone siq in high heeled clogs and rouge rather than hikers and sunscreen. Just such a group of Italian women collapsed into chairs near us at one of the cafes, clearly exhausted by the downhill walk into Petra. Relieved and thirsty, obviously content with the day’s accomplishments, they chattered away ordering drinks and easing their tall strappy shoes from their aching feet. Moments later a pair of older gentlemen called from the road in disbelief. Their bonnet-like hats and large black sunglasses couldn’t hide their irritation at emerging from the washroom to find the women already taking a break. While we couldn’t understand their Italian the tone and body language were clear enough. Meanwhile the waiter, cleverly outfitted in a bedouin headscarf and with his eyes blackened like, I guess, a desert nomad, or maybe a gay pirate, had obviously seen this song and dance before, rushing over with some to-go cups. The women appreciatively transferred their scalding drinks and tottered off into the sweltering 35C heat. We stayed at the Cleopetra (get it? petra?) Hotel run by the friendly and welcoming Mosleh who, according to his business card, is also a fully qualified “Peacemaker”. Luckily we had no occasion to use that particular service, but it was one place where we felt as though Jordan’s seemingly universal hotel motto was almost true – “Come as a guest, leave as a friend”. A friend who pays money. We often shared a living room with a boisterous old American guy, exceedingly friendly and a self-proclaimed “spreader of joy”. Noble intentions, however we highly doubted future Cleopetra guests would have their stay enhanced by him teaching Mosleh to say “Candy is dandy, but liquour is quicker.” Even worse was teaching Mosleh’s teenage cousin, who doesn’t speak any English, to approach girls and say “Can I please have a kiss?” No, that won’t be creepy at all. 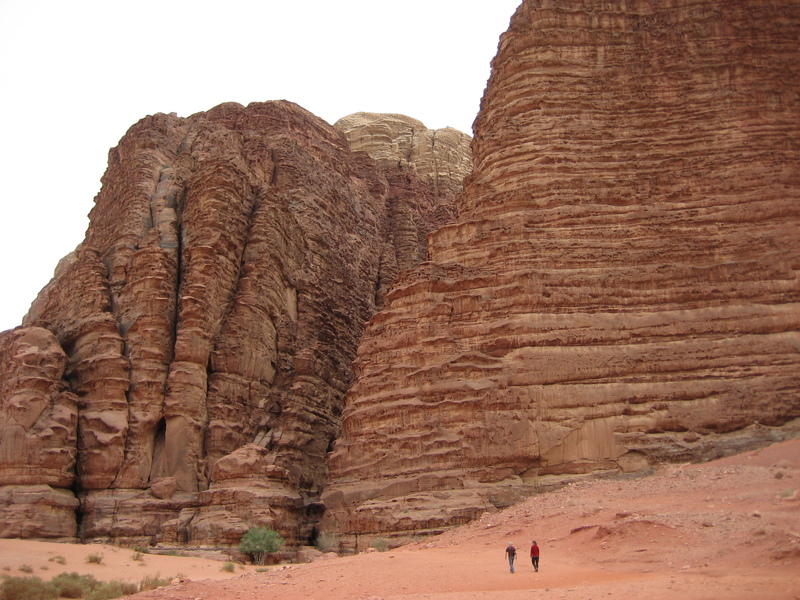 Then we were off to Wadi Rum along with Pete and Carol who are actually not, as their names might suggest, the neighbour couple on a raucous family sitcom. No, in fact, they are just a pair of friendly Kiwis traveling between jobs. Wadi Rum also has a famous history in film, playing a starring role in Lawrence of Arabia (not to mention Lawrence’s real life adventures). Another amazing place that didn’t disappoint, with surreal desert landscapes topped off by one of our most peaceful sunsets and a comfortable night in a desert camp. In the morning the four of us, along with our guide Tashid and his helper, were joined in our tiny old truck-style Land Rover by another 6 campers. By the time we all squeezed in we resembled a clown car in a no-budget military circus. The front was really only built for 2 but we forced in 4, with Laynni half on my lap and half out the window and Tashid’s buddy occupying the dangerous middle spot, one leg on either side of the giant old gearstick, the type that moves 3 feet from 2nd to 3rd and has to be rammed 2 or 3 times before catching. The sharp yelps and pained groaning did not come as a surprise. Despite all this, however, Tashid still felt the need to dig out his massive old 1984 Sanyo ghetto blaster from behind the seat to be balanced on our laps, blasting music, while he sorted through his collection of favourite cassettes. They say music helps ease the pain but I’m not sure that was the case here. After that we horned in Pete and Carol’s ride to Aqaba where they rented a car from a guy in a vacant parking lot and we snuck into the backseat. We stopped off at Shobak, an old Crusader fort perched impressively on top of a huge hill overlooking the village. Its most interesting feature is a pitch black escape tunnel that drops straight down into the bowels of the the mountain. Fears of darkness, enclosed spaces or – as in Laynni’s case, going down steps – can make this an even more interesting adventure. Then just when it seems it will never end a tiny escape hatch deposits you at the bottom of the hill, far from the fort itself. It’s easy to envision a vanquished army emerging from the tunnel, poking their heads out one by one and squinting in the sunlight before stumbling to the ground, looking around furtively then clumsily lurching off as fast as their rarely-used leg muscles will take them, armour clanking and face-plates continually falling over their eyes. Late that afternoon Pete and Carol dropped us in Dana Nature Reserve where we spent a couple days hiking among the beautiful hills and tall, lanky European couples, their unhappy children clearly wondering how climbing straight up and down hills constitutes a vacation.